The opposing team is receding back to defend their goal. Examine their set up and strategic defenses and be sure to cooperate with your teammates to ensure that you break through their defensive body with ease! Jump through and past the competition as you make your way through the bodies. 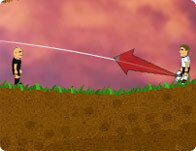 Use your mouse to click on the player and pull back to launch. A wicked soccer game with an elastic touch. Use your players as if they were rubber bands - pass the soccer ball around your players and try to shoot a goal. This game features 4 different hooligans, 4 stages plus 3 unique minigames. Bribe the Referee feature and 25 different and funny hats such as "Stalin Haircut". Simply click on the ball repeatedly and try to keep it bouncing in the air as long as possible. Checkout your soccer skills with a Kick-off a great season! Aim for the gliding goal post to score! Try to score a goal, it is not that easy.